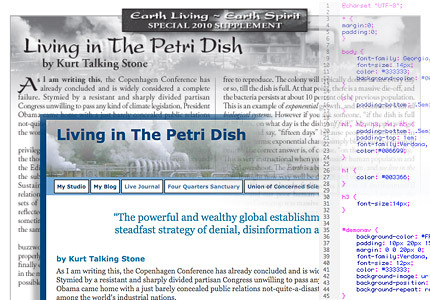 Why CSS Matters – Living in The Petri Dish. Yes, it’s been months since I’ve posted here. And haven’t been that active in my Live Journal or Facebook pages either. The Studio’s been busy, folks. And have been shoving a number of projects through the house. And when you’re a self employed Creative Pro, paid bookable hours trumps blogging. I had been tempted to rant on about the evolving throwdown between Adobe vs Apple vs Google (sort of) vs Mircosoft, centering around the mobile market, web standards, web video, HTML5 and Flash. But the simmering war of words, with flaming fanboy camps tossing off on each side has grumped me out, and it can wait. Some of you may, and some of you may not know this, since I haven’t talked about it here. But I do have a Facebook account, then of course, like any good Design Pro, I have a Page for the Studio. And as more of my clients ask about *gasp* social networking, I have to become more familiar with some of the options and technologies. Now this blog is powered by WordPress, WP hacks can tell from the very lightly modified default Kubrick page design. But one of the things I love about WP is that there is not only an abundant supply of themes, but also a HUGE zoo of plug-in to perform all manner of digital legerdemain. Since I have been manually posting notifications on FB about my Blog Posts here, I figured, with the rising popularity of Facebook, there was probably an app or plug-in that would allow Me to post notices to the page automatically. So after a bit of research, I’ve installed the WordBook Plug-in on the blog. This was literally it’s test flight. HTML code in Text Wrangler. Want a piece of this action? Hello everyone who may or not be paying attention. I know it’s been a while but I was a bit distracted by some very consuming system issues with my workstation. But that cautionary tale is a subject for another post. Seriously. Cautionary. Tale. But not now. What Graphics Programs Should A Pro Graphic Designer Know?